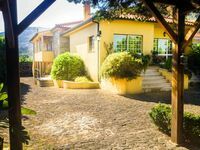 "Quinta da Ribeira Ponte de Lima"
Property 26: "Quinta da Ribeira Ponte de Lima"
Charming converted farmhouse with private garden, garage and pool. Property 41: Charming converted farmhouse with private garden, garage and pool. Caterpillar Charm Rural House - Tourism In Rural Area. Property 50: Caterpillar Charm Rural House - Tourism In Rural Area. Wonderful eclectic mix of charming, modern, seclusion and accessible ! Our family of five adults enjoyed a lovely stay at Quinta de Santa Cruz. The home's restoration has been carefully managed to maintain the rustic charm while bringing in light and elegant, modern conveniences. We loved the views with our coffee in the morning as well as snuggling into the cozy lower level to watch a movie in the evening. 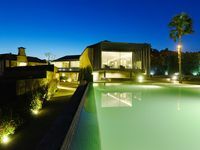 In addition, this home was perfectly located - we took an easy day trip to Oporto and another to the Douro River Valley. We would love to stay here again should we travel back to Portugal. The house is a converted farmhouse, a little dated but with rooms on all three floors. The top floor has a double bed but with limited headroom. On the ground floor is one room with large double bed and en suite bathroom and dressing room. The other rooms have standard doubles and there is a further bedroom on the lower floor with bathroom but due to a leak downstairs it wasn't possible to use it. We reported this to Luis the owner who was very prompt in responding and also provided sun loungers at our request. There is a games room with table tennis etc on the lower floor but as we didn't have children with us we didn't use it. There is also a washing machine, pegs and an airing rack. The outdoor space was well set out with lots of sun ( the photos make the pool look dark but we had sun all day and into the evening). The kitchen is well stocked with crockery and the like and is open to the outside space so we ate outside every day. The Wifi is good and the TV is modern so we could watch Netflix via a mobile phone and Chrome cast. As we were only 2 couples in a big house we didn't use every room but there is lots of space to find a quiet corner if necessary. The house is not overlooked and is a short walk to the local bakery and takeaway. Luis gave us names of local restaurants to visit. We shopped in Arco de Valdevez , a lovely historic town with many shops and cafes as well as 3 different supermarkets. We visited the newly restored manor house outside the town , entry of one euro and a really interesting place to look around. The house is also fairly close to the Penedes Geres , the national park which is a good place to spend a day exploring and in cooler weather to go walking on the trails marked out. All in all we liked the house a lot and the location is brilliant, out of town but close to the amenities. The area is beautiful, peaceful and very rural.